Fort Sumter, located in Charleston, South Carolina harbor, is perhaps best known as the site where, according to tradition, the first shots of the United States Civil War were fired. 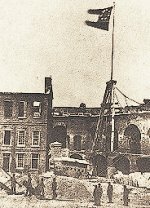 On April 10, 1861, the Union garrison in the fort was told to surrender by Brigadier General P.G.T. Beauregard in Charleston. This demand was refused and on April 12, 1861, Confederate batteries opened fire on the fort. The Union return fire was ineffective. On April 13, the fort was evacuated after surrendering. The only casualties took place after the surrender, when two Union soldiers were killed, and two others wounded during an explosion of a cannon during a salute that occurred during the evacuation. Accounts often describe Charleston residents along what is now known as "The Battery", sitting on balconies and drinking salutes to the start of the hostilities.